We live in the age of pass codes. We have codes for our home alarm system, codes for the garage door, pin numbers for ATMs, codes for home safes, combination locks for school and gym lockers. And don't even get me started with the gazillion-and-one passwords for online accounts. Each one is supposed to be different. Different lengths, different characters. Numbers, letters, a combination of the two. Some have to be changed every six months for maximum protection. With so many numbers crowded in my head, I can barely remember my husband's cell phone number. Fortunately, there's a company called WordLock, that makes my life a bit easier. They've come up with combination locks that use words instead of numbers! OMG -- can you say sliced bread? 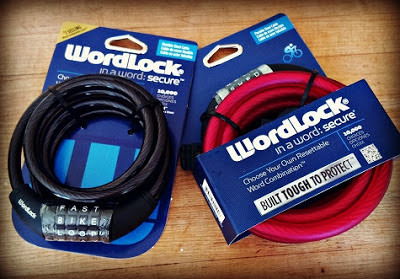 I first discovered WordLock almost a year ago, when I stumbled upon their four-letter combination bike locks at Target. Neither The Pea nor I can ever remember the 4-digit passcode for her combination cable bike lock, so it was such a relief to have locks with passwords that my boys could actually remember on their own! A couple of months after that, by some happy coincidence, WordLock invited me to review their TextLock word-based padlocks. This time around, they sent me a couple of their bike locks to review. The first kind they sent me was a Mini-Cable Lock, identical to the one I got for the boys, but in pink. The Pea is so happy! She has started biking to school, so this could not have come at a better time. Her old numerical cable lock has started getting rusty, and she has been so envious of her brothers and their WordLock bike locks. 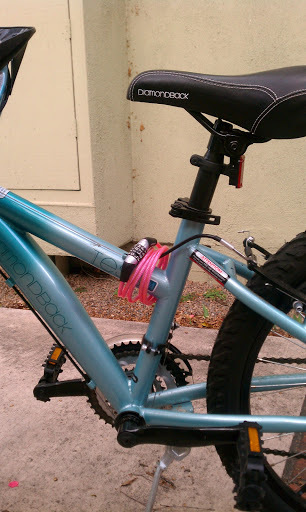 Her new lock winds easily around her bike frame, so it doesn't bother her when she pedals. It's light and flexible and easy for kids to handle. The password is pre-set and cannot be changed, but it's much easier to remember than a 4-digit combination. 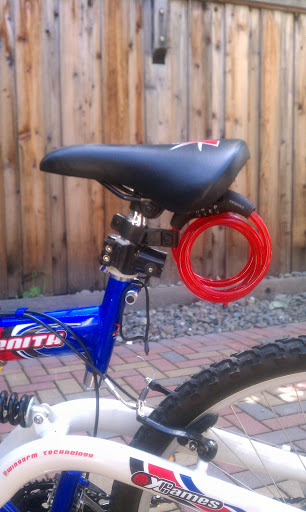 This is waaay better than your run-of-the-mill kids' bike lock! WordLock also sent me their regular Bike Lock, which is quite an upgrade from the Mini-Cable Lock. It comes with a mounting bracket, so you can get it on and off your bike easily. It's 5 feet long, so you can wrap it around trees and awkwardly-shaped bike racks. It's made of thick, braided steel, so it deters bike thieves. Best of all, you can set your 4-letter password to any word or letter combination that has meaning for you, so you'll never forget it. Setting the password couldn't be easier -- even I can do it. There's an inner dial with 2 settings. Just open up the lock, turn the inner dial to "set", set your password, then turn the inner dial to "lock", and voila, you've locked in your password! To reset your password, just go back to the beginning of the previous sentence and start again. If you're worried that someone might guess your password, don't be: you can set up to 10,000 possible letter combinations. They don't even have to be proper words: you can use acronyms (i.e. BLWL -- Bonggamom Loves Word Lock) or that crazy unique name you gave your child (and they all laughed when you named him Zeek, little did they know you were actually creating an easy-to-remember password). Leave a comment on this post and tell me your favorite WordLock item. This entry must be completed before any extra entries will count. This giveaway ends at 11:59PM PST on April 6, 2012; I will draw a winner at random on April 7 and post their name after they confirm acceptance. Continental US residents only. For additional giveaway rules, click here. Good luck! Disclaimer: I received product samples to facilitate my review. Thanks to WordLock for providing the giveaway prize. The views and opinions expressed here are my own. The Discus Lock would be perfect for hubby's work trailers! I'm getting a new bike next month, so my favorite wordlock is the bike lock! California Bikes This cruiser also has a forward pedaling desigen, meaning the pedals are shifted four inches forward to allow for better leg extension and more open and comfortable seating position. I really like the bike lock, but the luggage lock would be really useful for me as well. I like wordlock on facebook Claudia N.
I love the bike lock. My entire family just got bikes so we are need of these! I like the Red color textlock word based padlocks .Pink is also looks great..
Congratulations to the winner: #37, dealsfan32! These bikes feature a well built frame, with the most high end seats on the market. It has an extended frame and forward pedaling which make it an exceptionally comfortable cruiser for taller people.